With the Red Sox making the signing of third baseman Pablo Sandoval official, and the club has designated Ryan Lavarnway (pictured) for assignment to make room on the 40-man roster. The Red Sox now have ten days to either trade Lavarnway or try to pass him trough waivers, but even if he were to clear waivers, he has the right to elect free agency if the club outrights him to Pawtucket. Thus, it is likely that the club will explore a trade for the catcher/first baseman first, although the return would probably be limited. 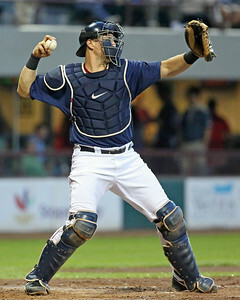 Lavarnway was selected out of Yale University in the sixth round of the 2008 draft after three years in the Ivy League. He began his professional career in Lowell that same year, and in 2009 was assigned to Greenville where he posted strong offensive numbers, earning the first of three consecutive Soxprospects.com Offensive Player of the Year honors after slashing .285/.367/.540 with 21 home runs. He repeated that strong performance in 2010 at Salem and Portland, finishing the year with a .288/.393/.489 line and 22 home runs between the two levels, with the Red Sox honoring him as the system's Co-Offensive Player of the Year (along with Anthony Rizzo). 2011 may have been his best year in the system, as he hit 32 home runs between Portland and Pawtucket while slashing .290/.376/.563, earned his first major league call-up, and was again named a Co-Offensive Player of the Year by the club, this time sharing the honors with Bryce Brentz. The strength of his offensive performance made his stock continue to rise despite questions of whether his defense would improve enough to allow him to stay behind the plate, and by the start of the 2012 season he had peaked as the fifth-ranked player on the SoxProspects.com rankings. 2012 was something of a lost season and started a decline in Lavarnway's standing within the organization. During the offseason, he reportedly lost 20 pounds while playing in Venezuela, ending his time there early, and after he regained the weight, he lost it again, this time on purpose, in an attempt to become more agile behind the plate. Whether or not that was a factor, his power waned, and he hit just 10 home runs between Pawtucket and Boston that season. By 2013, his offensive numbers fell across the board, despite reasonably good numbers in the majors that season in a very small sample size. With his defense behind the plate still questionable and top prospects in Christian Vazquez and Blake Swihart catching up to him, he started playing some first base in 2014 to try and find more opportunities. However, he battled injuries throughout the season, including a broken hamate bone in his left wrist that caused him to miss significant time. Given that Lavarnway was out of options and had become something of a "tweener" - not strong enough behind the plate to handle more than a part-time workload there, but not hitting enough to justify a spot at first base - many speculated that Lavarnway's 40-man spot was in jeopardy this offseason.